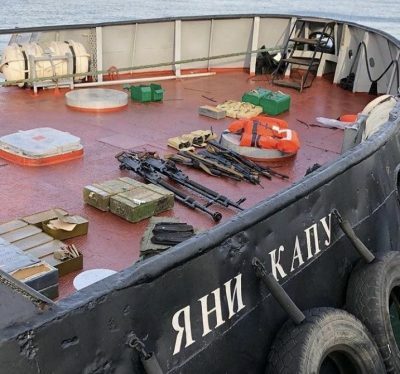 It appears that Western experts and Ukrainian diplomats successfully “forecasted” the November 25 escalation in the Black Sea in middle November. As expected, the report primarily focuses on Russian influence, since other influence from the EU and the US cannot be considered any sort of influence, especially not bad. It also primarily focuses on Ukraine. In the section dubbed “Security Assistance in the Short and Medium Terms,” the situation in the Sea of Azov is highlighted. The US and NATO provided training to both Ukraine and Georgia. And under the Donald Trump administration, the US, “at long last” provided Javelin missiles to both countries. Furthermore, the US may and should also consult with Georgia and Ukraine for further military assistance, according to the report. “It would also be useful for the United States and the EU to consider a proactive use of sanctions to deter further Kremlin aggression. To date, sanctions have been used to punish the Kremlin for past sins, but they also can be used to discourage further aggression.” Giving as an example, that the Kremlin “keeps taking more territory in the Donbass,” despite the ceasefire. Also, despite that even the OSCE doubts that there are signs of Russian participation in the region. Furthermore, the report also presents a suggestion on fighting “Russian aggression and provocations” in the Sea of Azov. After the Black Sea incident between Russia and Ukraine happened on November 25th, Anders Aslund, a Swedish economist who is a fellow in the Atlantic Council urged the US to send warships to the Azov Sea, in another country’s maritime territory after the Ukraine-Russian standoff in the Kerch Strait. Aslund in a sudden urge to increase absurdity also compared the incident to Adolf Hitler’s invasion of Poland. In addition to that, on November 17th, U.S. Secretary of State Mike Pompeo and Ukrainian Foreign Minister Pavlo Klimkin met in Washington D.C. Furthermore, it appears that a “provocation by Russia” was expected in one way or another, as it becomes somewhat apparent from the Ukrainian Foreign Ministry’s press release. With all of these preemptive reports and warnings against “Russian provocations” it appears that it would not be surprising if there was an attempt at a coordinated effort to cause an incident by Ukrainian President Petro Poroshenko. However, judging by US, NATO and EU reactions so far, Poroshenko may have listened to a wrong adviser from his wing, as the play appeared to be botched. Luckily, no Ukrainian or Russian ships were sunk, and nobody lost their life. Barring some injuries, the incident failed to lead to a very large scandal, despite hyper-measures undertaken by Ukraine in the face of martial law. It would make sense that Poroshenko expected the ships would likely be destroyed, judging by the Su-30 claims of November 27th. However, it appeared that the Russians decided to surprisingly not be as “aggressive” as expected. To create some perspective – imagine if a Syrian warship somehow entered “Israeli territorial waters” – unsurprisingly that ship would more than likely be immediately destroyed, no questions asked. And the whirlwind in mainstream media and the rhetoric from the US, NATO and EU would most likely be much calmer than in the Ukraine-Russia scenario.